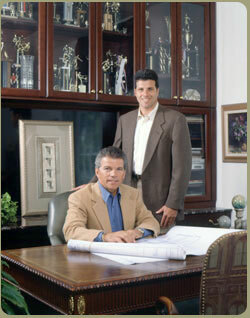 Vito Anthony Pampalona has been building homes of exceptional quality since the early 1970s. He began with the idea of combining Old World quality with New World technology, to create homes that were both comfortable and modern. He has built a reputation as a very understanding and caring builder who looks at forming a “partnership” with each home’s eventual owner, and working together to arrive at exactly what that owner desired in a home. Mr. Pampalona founded Vito Anthony Homes in 1973, and was soon joined by Tom Saracino, who is now Vice President of the corporation. Mr. Saracino, a graduate of Western Michigan University, is a quarter-century veteran of the construction industry. The two men head a talented team of building professionals – architects, designers and craftsmen -- who look at their chosen careers as being far more than “jobs.” They are dedicated to building homes they can be proud of. Vito Anthony Homes.